Here is a sampling of Web sites designed and developed by Energize Software. A description of the unique features of each site is also listed. 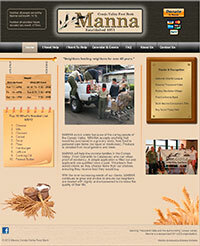 www.MannaConejo.org - Conejo Valley Food Bank. Non-profit organization that collects donations online. Optional Spanish translation on one page. Integrated Google maps for directions. Dynamic slideshow and popup text boxes. In-place self-editing of selected content by the client. Pages include 'I Need Help', 'I Want To Help', 'Calendar & Events', 'FAQ', 'About Us', and 'Contact Us'. 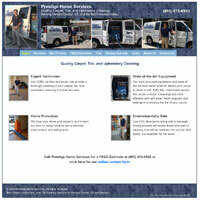 www.PrestigeHomeServices.net - Carpet Cleaning Services. Many pictures showcasing services provided. In depth descriptions of how services are performed. 'Hidden' landing page for google adwords. Pages include services, our process, faq, tips, pricing, links, about us, and contact us. Unique and easy-to-use Web site with colors and logos of the business. Pay securely for housecleaning services with a credit card online. Attractive gift certificates for cleaning services can be purchased with a credit card online. Provides users with services offered, pictures, testimonials, and special offers. 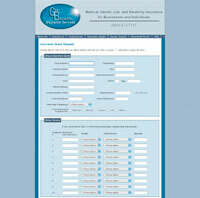 Customized "Free Estimate" form with many options and validation of entries. Unique coupon displayed upon completion of the "Free Estimate" form. Owner of the site is immediately notified by a cell phone message and email of new requests. Frequently updated vehicle reviews and special automotive articles. Dynamic, graphical, and interactive calendar of car shows and special events. Integration with the display of Google Maps and driving directions to an event. Interactive discussion forum with the registered users of the site. 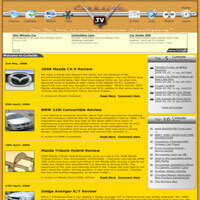 Custom search page for finding specific automotive information. Interactive photo gallery so that users can show their automobiles. www.GetBenefitsInsurance.com - Insurance services in Ventura County. Site for all your insurance needs. Multiple dynamic forms with validation to request a quote for insurance. Special pages for Adobe Connect Now, direct links to insurance companies. Provides users with services offered, pictures, and testimonials. Psychiatrist that treats depression, anxiety, bipolar disorder, ADD/ADHD and substance or alcohol abuse. Custom registration form allows access to video library. Scrolling categories of video libraries. Client login area to access registered user database. 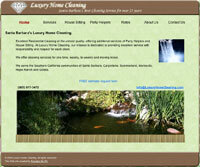 www.LuxuryHomeCleaning.com - Santa Barbara's premium home cleaning service. Relaxing theme, nature oriented design. Easy-to-use Web site with colors and logos of the business. Provides users with services offered, pictures, and contact information. 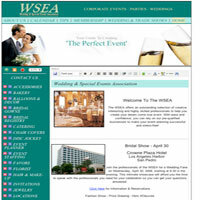 Presents wedding services available by category of various businesses that support the site. Custom, built-in text editor to facilitate dynamic updating of the content pages by the site owners. Unique versioning system to save previous dynamic content so that older versions can also be displayed easily. Categories can be renamed or deleted dynamically as new member businesses join the site. Members-only access to a custom discussion forum. Multiple user forms available that perform validation and error checking on the entered data. Editing of content utilizes "Web 2.0" or "Ajax" technologies to make the experience very fluid. www.arcdesigngroup.net - Artistic residential creations by a Camarillo, CA architectural company. A showcase of homes by a full service architectural company. Thumbnail images of homes that can be expanded to a larger size. Elegant and clean site that captures the style of the company. Performed modifications and additions to the site. 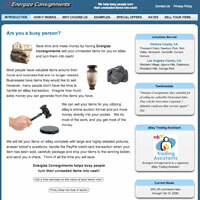 Gives users the ability to sell their items on eBay utilizing consignment services. Pages that describe the process, the company's unique abilities, and examples are displayed. Online request form is implemented with full validation and error checking. Site has a dual role of also hosting the pictures for the eBay auctions themselves. Logo created with animation capabilities.